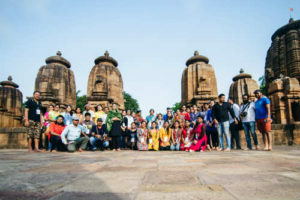 Bhubaneswar: The 75th Ekamra Walks Old Town Circuit saw participation of nearly 70 heritage enthusiasts as they explored the monumental wealth of the Ekamra Kshetra today in two different groups. While senior officials from State Bank of India (SBI) formed the first group with the Deputy Managing Director of SBI Corporate Centre in Mumbai and Managing Director and Chief Executive Officer of SBI Mutual Fund, Anuradha Rao, joining the group with other senior officials of the bank’s regional and local offices. 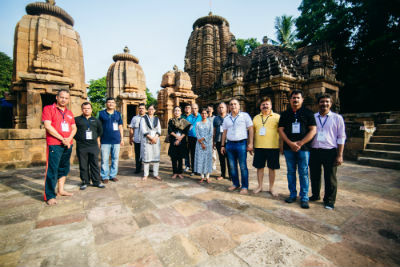 The second group consisted members of Odisha State Tourists’ Guide Association (OSTGA), Odissi dancers, visitors from other parts of the state and writer and architecture student from Mumbai. Apart from the DMD of SBI Corporate Centre in Mumbai, CGM Sanjeev Naryani, GM-II Kolkata Regional Office Mahesh Goel and Sanjay Tiwari, GM SBI Corporate Centre Mumbai along with other local senior officials were part of the special group comprising the SBI team. Members of Odisha State Tourists’ Guide Association today celebrated their foundation day by participating in the 75th Ekamra Walks Old Town Circuit, as this unique event has helped in showcasing the story of Ekamra Kshetra through effective guiding by one of the prominent members of the body, Satyaswarup Mishra, who has been associated with the Day 1 of the walk on December 18, 2016. The OSTGA was formed on May 20 in 2007. Guides from different parts of the state participated today in the heritage walk. Globe-trotter Paulo from Italy today joined the walk among others and enjoyed his time exploring the beautiful monuments. He was there at the Monks, Caves and Kings heritage walk exploring Jain monuments in Udayagiri and Khandagiri. 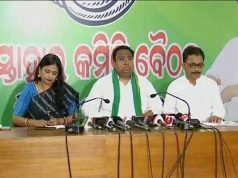 Travel writer and professor in English Literature from Chatrapur in Ganjam district, Sujata Patnaik termed the Ekamra Walks Old Town Circuit as an innovative concept to attract the tourists from across the globe. “I will definitely request all in our circle to explore this walk,’’ she added. Sujata’s husband, former scientist with Indian Rare Earths and now independent consultant RC Patnaik hailed the efforts of Bhubaneswar Municipal Corporation, Bhubaneswar Development Authority and Odisha Tourism and hoped that similar initiatives should also be replicated in other parts of Odisha as the entire state is a home to beautiful monuments with rich history and matching tales to pull visitors’ imagination from India and abroad.